ALERT: Please CLICK HERE for the West Vancouver EVELYN by Onni VIP Info > Previews Start November 2011! An inviting new residential enclave nestled on twenty prime acres of garden property, ideally situated above the Village of Park Royal comes the luxury West Vancouver Evelyn condo homes for sale. With architecture inspired by Canada’s Arthur Erickson, Evelyn West Vancouver luxury homes for sale celebrates West Coast modernism in a landmark Sentinel Hill property that is simply breathtaking and unbelievable. With impressive shops and transit right at your doorstep, you’ll enjoy effortless access to urban conveniences, an endless array of recreational activities and a stunning outlook to call your own, here at the new West Vancouver luxury homes for sale at Evelyn Park Royal. Evelyn Garden Homes start from $1.12M and feature two bedroom and family room floorplans. The West Vancouver Evelyn Estates for sale start from $659,000 and feature one and two bedroom luxury homes for sale. Now selling, please visit the Evelyn West Vancouver Park Royal presentation centre at 710 Keith Road at Taylor Way in the North Shore. They are open daily from 12 to 5pm and closed on Fridays. The extended 2010 Olympic Hours are between 12-5pm daily until February 28th. Call 604.921.1010 or visit evelynliving.com today for more information on the luxury West Vancouver homes for sale at Evelyn Living by Millennium Luxury Collection. For more information about the Evelyn West Vancouver condos and estate homes for sale please click here. One of the most prestigious and sought after neighbourhoods in all of the Lower Mainland is in West Vancouver real estate market, and now, it is your opportunity to purchase a luxury Evelyn Condo home on Sentinel Hill just above Park Royal Shopping Centre. Heritage, luxury, modern architecture and lush interiors are all waiting for West Vancouver homebuyers seeking an affordable new Evelyn condo home that is centrally located in this enclave. 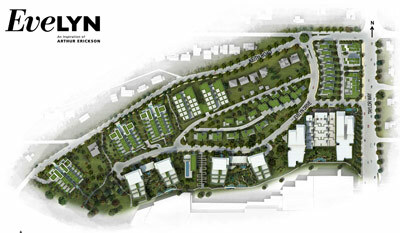 A 20 acre master planned community on the hills above the Village at Park Royal, the luxury West Vancouver homes for sale at Evelyn Living will feature a wide variety of floorplans and housing types that include terrace city homes, cluster homes, single family residences, townhomes and even one and two bedroom luxury condominiums for sale right now. With a very tight restriction on new housing, this new West Vancouver real estate development gives homebuyers a new opportunity to own in this prestigious community, at an affordable price too. The sheer variety of home plans and floorplans makes the Evelyn West Vancouver luxury homes for sale one of the best new developments in more than a couple of decades, giving purchasers a lot of variety and price points to choose from and which fit your lifestyle. Inspired by Arthur Erickson, one of the premier architect designs in Canada, the West Coast style Evelyn West Vancouver luxury homes for sale are designed for sustainability and environmental sensitivity, making sure that you and future generations lives a cleaner and healthier lifestyle for years to come. With lots of outdoor living spaces, homebuyers will also have an option of extending their living quarters to the natural wonders of the West Coast forests. With sweeping sunsets and views these luxury West Vancouver Evelyn homes for sale are in the heart of the vibrant Sentinel Hill Park Royal community that is booming with lots of shopping and dining options throughout the neighbourhood.